Quilting Adventures: New Project .....! Thank you friends on blog land for your lovely comments regarding the newspaper article on Fibre Junction. It has been quite the year, an extremely busy one, yet quite rewarding. 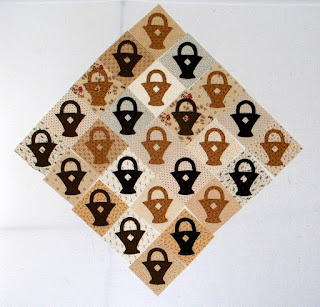 Lots has been going on, I finished machine quilting Coney Island, a pattern by Fig Tree & Company. However, I cannot show it to you until I have sewn the binding on it. That's my motivation to get it done so I can show it to you! I'm anxious to call this one finis! 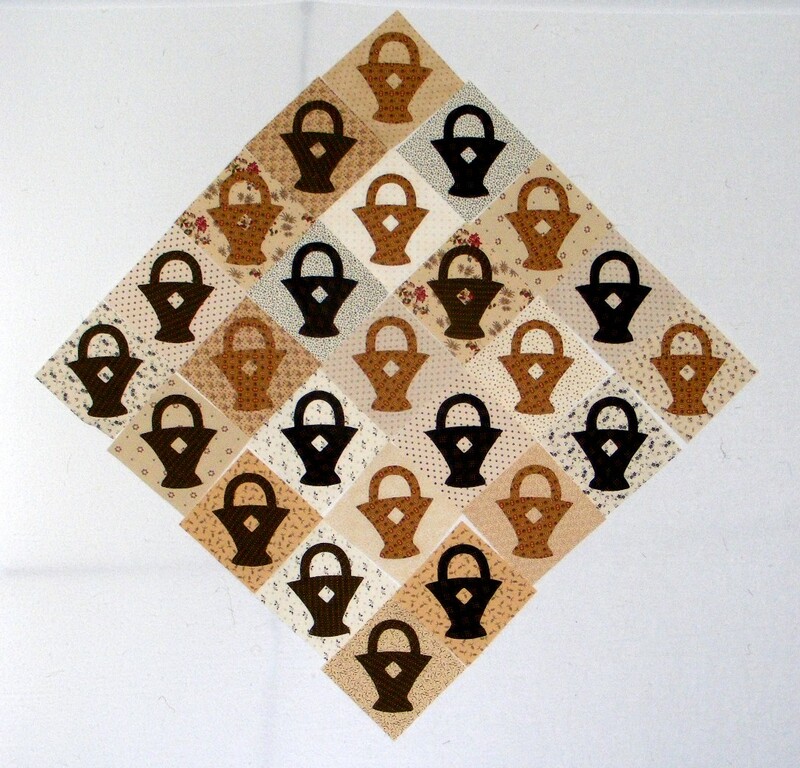 The quilt pattern is called Trick or Treat by Blackbird Designs. It's from their book When the Cold Wind Blows. I fell in love with this quilt and just had to make it. To quote Alma "Anytime someone tells me to cut 300 of anything, it takes my breath away ... but one look at Barb's quilt and I had to say. 'Let me get my scissors!'" My sentiments exact! You have made lots of progress on your nice baskets. I have been hand appliquing mind, but think I'm going to switch to machine applique ..... my hand(thumb) will probably thank me. Lovely little baskets. I never would have thought to try toast and black together. Beautiful! Your baskets are just gorgeous...wow, you have a lot done already! Great baskets...I am doing them in '30's prints...but silly me, I am needleturning...slow progress! Ha! Thanks for clearing that book reading thing up -- I was going to ask to please share your secret for being able to read AND prepare applique at the same time. Those baskets are ADORABLE! What a lovely article about your shop! And I want to know who Cheryl Patch is. I don't hear that name very often! I LOVE LOVE LOVE that basket quilt. It is so cute. I started basket quilt months ago. It's still sitting here looking at me. lol Yours is going to be beautiful. I'm so happy for you and your shop. I knew it would be great!!! Oh how I love those baskets and the colours you've picked. Keep'em coming. Oh I love your baskets! But I don't think I would have enough patience to make too many! Wow, you've gotten so far on your basket blocks! I love that quilt too. I'm just not sure I have the staying power to get through all 291 of them! Good for you for doing so~ It is a beautiful quilt.